In a post last week I discussed our forecast tax situation for 2015. It's a weird place to be in as I don't expect us to normally be in the 15% tax bracket but there's a big benefit to that: qualified dividends and long term capital gains are taxed at 0%. That's a great position to be in and since then I've been examining my portfolio for potential candidates to take advantage of the long term capital gains being taxed at a lower rate. One position I'm considering selling is Baxter International (BAX). One of the reasons that Baxter is on my consideration list, heck the biggest reason, is that after spinning of the biotech arm in Baxalta (BXLT) they took the opportunity to decrease the combined dividend payout of the two companies. Prior to the spin-off Baxter was paying $0.52 per share each quarter and now the combined dividends from both companies is equal to $0.185 per share per quarter. That's a 64% decrease. I don't have a hard and fast rule about selling no matter what if there's a dividend cut and figured that Baxter has been a truly excellent company for decades if you look at all of the spin-offs they've completed. I've already disposed of my Baxalta shares so today I wanted to take a closer look at Baxter's future prospects. I wanted to take a look what could be in store for the dividend going forward. Management recently discussed 3Q earnings which showed EPS for the quarter excluding special items of $0.41 and guided to 4Q earnings of $0.23 to $0.25 with 2H EPS at $0.58 to $0.60. The payout ratio for 3Q came in at 28% and for 2H would be around 39% if their forecast is accurate. So let's look at a range of possibilities for what the dividend could look like over the next few years. The above table shows the consensus earnings estimates for the next three years. No forecast for dividend growth has been given by the company although I assume the dividend will be increased next year. 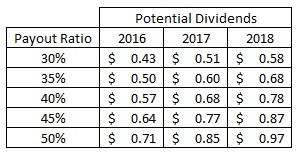 As a rough guide I used a range of payout ratios to get a glance at what the annual dividend could possibly turn into based on the mean earnings per share forecast. The current annualized dividend is $0.46. Here's what the annualized growth rates would look like based on the above dividend estimates. Obviously the 50% payout ratio scenarios look awesome. What's not to like about a growing company that's growing the dividend as well as expanding the payout ratio? As rosy as that scenario looks I don't find it that likely. If that was the case there's no reason for management to have reduced the dividend as much as they did when they executed the spinoff. However, I do expect the payout ratio to drift higher over time but that is likely to occur outside of the 3 years in this example. Since management did reduce the dividend to the 30% range I would assume that is the most likely case that will play out over the short term. That or the 35% payout ratio. 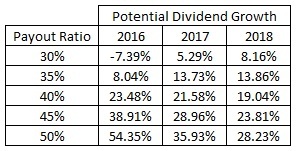 I'm honestly quite surprised to see that dividend growth would work out to 8% per year by 2018 using the 30% payout ratio case which makes for rather solid total return prospects, excluding share price changes, of 9.4% once you include the current dividend yield. However, the valuation is what has me concerned. The current price is just plain expensive with the current price being 19 times earnings that are over 3 years away from being realized. Not to mention that it assumes everything works out fine and that growth is realized. A more realistic case of paying 20 times FY 2016 earnings would mean the share price would need to decline to $28.40 or -23.8%. That's a pretty hefty decline to reach a more realistic valuation. At that price the FY 2018 forward P/E would be down to 14.6 which still seems a bit high for earnings that far in advance. Looking at it another way, at 20 times FY 2018 earnings of $1.94 the share price would be just $38.80 so the share price would be going nowhere over the next 3 1/4 years. There's the possibility, now that the company has been split in two, each company on its own could become a takeover candidate. Baxalta was targeted for a takeover by Shire PLC (SHPG) just weeks after becoming its own company and Baxter could be a compelling fit for the other medical device companies like Medtronic (MDT), Johnson & Johnson (JNJ), or Becton, Dickinson & Company (BDX). A buyout or merger would be a great source of short term returns but there's no telling if, when or for how much that would be worth. Of course there's also an opportunity cost involved with every investment decision. 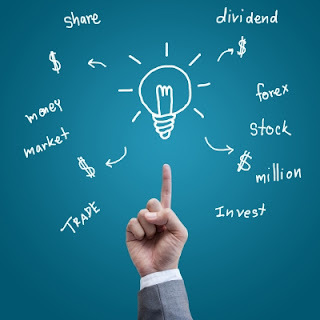 Namely is there a better option to invest this capital in to generate better returns? Here's how the future returns would look if you purchase one share at the current price of $37.25 and sold on December 31, 2018 at $38.80 which would be a TTM P/E ratio of 20 based on forecast earnings of $1.94. Despite the rather solid dividend growth all of that growth is cannibalized by the share price going nowhere because of the high current valuation. With an internal rate of return of just 2.60% the bar is set quite low. Also because of the low initial yield of just 1.23% the yield would only reach 1.55% by the end of 2018. These returns are based off the 30% payout ratio for dividends. The following table shows the returns based on the 35% payout ratio dividends from earlier. Even though the dividend growth is much better at 13.86% per year due to the increasing payout ratio , the annualized returns don't see much gain and show just an increase to 2.79%. All signs are pointing to rather lackluster returns going forward for my position in Baxter despite the potential for high single digit dividend growth or even more. Due to the reduction in the dividend, Baxter moved into my cross-hairs to be trimmed from my portfolio because it no longer fits my long term investment strategy. Is the company going to do well moving forward? Yes most likely they will continue to provide solid growth in operations as well as their dividend. However, the problems lie in the fact that the current valuation is way too high and the income provided by that capital has largely been depleted. Neither of those situations intrigues me from an investment standpoint. I'd much rather own a Johnson & Johnson (Full Analysis Here) that trades at a much better valuation of just 15.7 times FY 2016 estimates, provides more income now with a yield of 2.99% and should continue to grow the dividend in the 6-9% range over the same time period. I'm still working on determining what price I want to sell my shares for but Baxter is 99% of the way out of my portfolio. The downside to selling is that it will reduce my exposure to healthcare which has huge tailwinds behind it due to the aging populations both in the U.S. and abroad. I also have to then find another company to invest in, although finding one that can beat the low hurdle return of 2.6% should be relatively easy. If we were in our normalized tax bracket of 25-28% I'm not sure if I'd make this move because the tax man would take his share. However, that's not the case this year as we should be in the 15% bracket which will make our taxes owed on this 0% so the only drag on swapping this capital out for another option would be commission costs. After accounting for the round-trip commissions and assuming I can invest the proceeds at a 3.00% yield I can increase my forward dividends from this capital by over 140%. Potential candidates would be Johnson & Johnson or Ventas REIT (VTR) if I want to stay in the healthcare/quasi-healthcare space , Eaton Corporation (ETN) (Full Analysis Here), Union Pacific (UNP) (Full Analysis Here), United Parcel Service (UPS) (Full Analysis Here), Hershey's (HSY) (Full Analysis Here), V.F. Corporaiton (VFC) (Full Analysis Here). Is there something I'm missing about Baxter's future prospects? For those of you that owned Baxter pre-spinoff do you still own shares in both companies or did you divest that capital into other companies? Great evaluation, PIP. I had almost forgotten about BAX and BXLT as they've been sitting in my account collecting virtual dust. I didn't have a huge position in BAX before the spin-off so it was lower on my priority list to keep an eye on. You're argument for trading up to something with a higher dividend now plus the growth potential makes sense. It's something I'll keep a closer eye on for sure. I decided to go on and sell today. The future growth of the dividend based on the current path just isn't intriguing especially when you factor in the fact that the IRR just won't be impressive either because of the expensive share price right now. I expect BAX to look for acquisitions that will boost the profits and dividends faster than forecast here but that's such a big unknown as to when, what, where and how effective they will be. I'll reexamine BAX if they get a few years of consistent dividend growth behind them but over the next 3-5 years I think I can simplify my portfolio and improve my dividends. If taxes were involved I don't know if I'd make this move right here but a 0% LTCG rate opportunity is pretty hard to pass up. I sold my shares of BAX and BXLT immediately when it became evident that the combined dividend would represent a big cut. At first I thought about holding on, though I would have needed to double my holdings to get back to "full" positions in both companies. (I prefer buying in batches of about $2,500). With the dividend cut, though, it didn't make sense to me to buy more shares. Also, BXLT received an unsolicited buyout offer and the share price jumped nicely, so it was a good time to sell. Of course, I'm going to have to consider the tax implications. I'm thinking about selling some losing positions (which I believe don't belong in my portfolio anymore) to offset. My original plan was like yours where I'd hold on and see how things play out. From a total return perspective with a long term outlook I'll probably regret selling both companies, I sold BAX today and sold BXLT a couple months back because I needed cash. I wouldn't let taxes guide my investment decisions but since I'm not 100% on BAX for the long term now because of the big shift in the company post split it made sense to sell and take advantage of the 0% LTCG for this year. I'm looking at culling a few other positions as well that I might not deem as long term holds that I have 100% conviction in. I sold my BXLT a couple months back because I needed capital and they met the requirements I needed for selling. Like you I'm not 100% confident in BAX over the short term especially in regards to the dividend. The forecasts in my analysis paint a decent picture for DG going forward over the next 3 years but because of the low yield it just won't be anything significant despite solid DG. JNJ was looking much better down in the mid-$90's but it's still on my potential list if it comes back down to $100. JNJ has a higher current yield and is almost a sure thing to continue to provide 6-8% annual dividend growth.